THE couple that trains together, stays together and that is the truth for Gympie's Lee and Wayne Collier. The couple could never be accused of missing a workout, including a stop at the gym on their wedding day on October 1. "We popped into the gym before the reception to have the photos taken,” Lee said. Lee, 48, and Wayne, 52, have been friends for about 20 years and a passion for fitness is something they share. They started dating about eight years ago. "We used to train together at the gym,” Lee said. Three years ago Wayne proposed to Lee during dinner at Kingston House. "I went to the bathroom and he had my favourite song playing on his phone when I came back,” Lee said. They were married three years later. "I was really nervous this time, it was very emotional,” Lee said. Lee's eldest son, Braden, 21, and Connor, 18, gave her away in a special moment. Wayne's grandson, Tyler, 12, also took part. "That was really special. I was really worried they wouldn't arrive on time,” Lee joked. Lee said they chose to keep the ceremony simple. "We wanted to keep it very us. The guests were close people to us, about 60 people,” she said. "I just wanted to get it over and done with so I could get to the reception, to be honest. 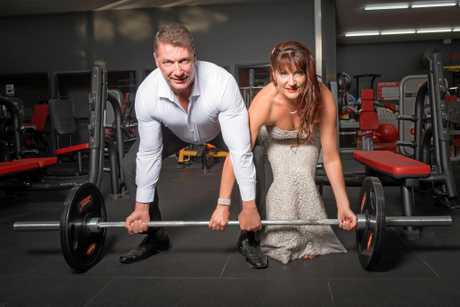 The couple escaped for the gym photo shoot before the reception, which was held at Kingston House, the site of their marriage proposal. "The venue was set to go. I hadn't seen the wedding cake. I kept a few things a surprise,” Lee said. "I sang our bridal song to Wayne. He didn't know, so that was special. "Wayne stood there and cried, it was that emotional. Lee and Wayne had a late honeymoon at Palm Cove, near Cairns, in March. They both plan to keep working and investing in property before they semi-retire.